More from the 2016 Tony Awards red carpet and we’ve got dramatic satin ensembles, some dresses I keep changing my mind about and an excellent assist from the wind on the posing stakes. For more check out Part 1. Danai Gurira is a TV Ate My Wardrobe regular and she did not disappoint in bold yellow Rosie Assoulin. 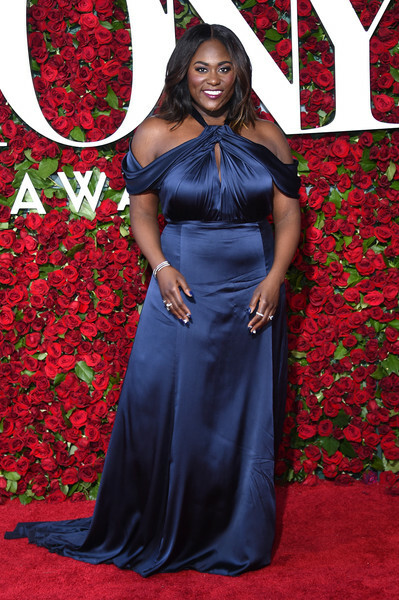 Satin is tricksy because creases, but Danielle Brooks slays in Derek Lam and I just remembered that OITNB is back this week! More midnight blue and a Narciso Rodriguez dress that is very 90s; throw on a plaid shirt and Claire Danes is more than halfway to Angela Chase. The windy evening gives Hamilton star Phillipa Soo an extra dramatic walking and posing boost in a Prabal Gurung frock which is just the right side of bridal. Mixing textures is definitely a big look of the night. 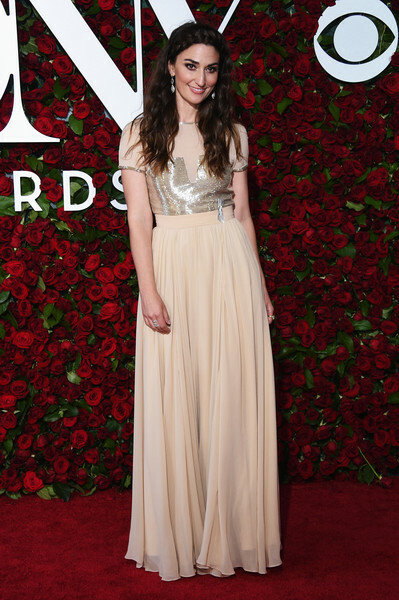 From bridal to bridesmaid, which sounds like it isn’t a good thing; however I think Sara Bareilles looks fantastic in an ethereal Gomez Gracia frock with a metallic bodice. Waitress is on the list of things I want to see on my New York trip in the fall. You can watch the cast performance here. Entering the red zone with Jane Krakowski in custom Michael Kors and another triumph on the texture front with a hint of sparkle. I’ve gone back and forth so many times on Keri Russell’s Monique Lhuillier crimson dress and I’ve come to the very surprising conclusion that it would work better as a jumpsuit (something I have never said before). Front split dresses always looks somewhat awkward to me, but they were one of the style repeats from this red carpet (see also Michelle Williams). Russell only gave birth last month and she looks amazing regardless of my slight issues with the dress style. Plus, bonus red lipstick points. Fave couple alert and Rose Byrne is also doing the front split thing in red sequin Thakoon. Bobby Cannavale wears a silver ribbon (as did many others) as a way to acknowledge the Pulse shooting victims and the show also opened with a tribute to the gay club victims of this still hard to fathom extreme act of violence. Another dress I found myself going back and forth on and I suspect that Cate Blanchett’s inherent ability to make anything work is why I am drawn to her in this patchwork Louis Vuitton frock. Blanchett also wears a silver ribbon as a show of support to the Pulse victims. 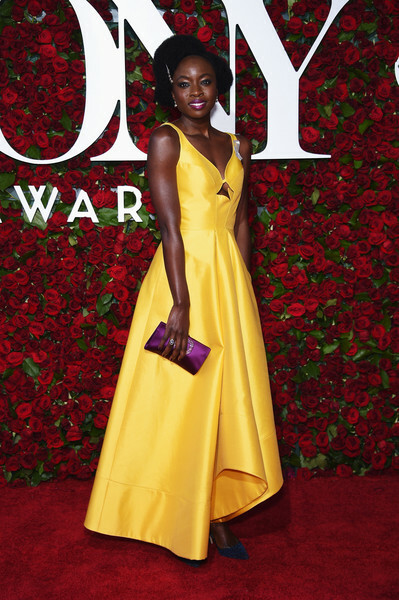 For Part 1 of the 2016 Tony Awards red carpet rundown click here.